It is no secret that consumers want to shop in stores that are inviting and visually interesting. There are many different ways to achieve this retail nirvana, but few offer as much versatility as curtain tracks in a retail space. Below we outline three reasons why you should install curtain tracks in your store or retail space. You can thank us later when the customers roll in. Curtain tracks are cheaper than walls, but just as effective. A ceiling-mounted track can be placed anywhere in the store, and can be used to block off an area (like storage), or direct foot traffic to the high-end items. They are commonly used to create changing room “doors,” or to create a whole changing room where none existed before (the 6100 Flexible Curtain Track is great for this application). Using curtains hung from ceiling tracks is an inexpensive way to create walls, and offers the versatility of opening or moving them when it is time to change the look of the retail space. Curtains make the place look good. Any designer worth his/her salt knows that the right decorative fabric hung in the right place can have a dramatic effect. Depending on the theme of the store and the items being sold you may want to hang heavy, decorative drapes, or see-through, ethereal sheers (or anything in between). Cover the walls, hang them behind the counter, or use them as aisle dividers: whatever you pick will add texture and ambiance to your space, making it seem richer, warmer, and more inviting. Curtain tracks let you get creative. Install a ceiling-mounted curtain track behind your display window, and voila, instant backdrop. Retail designers appreciate the ability to change the backdrop often by simply switching out curtain panels, but that is not all they can be used for. With the right drapery hardware, such as our beaded chain and bulldog clips, the track can be used to hang signs and other design elements in the window as well. The ease of changing out the elements and backdrop keeps the window display fresh, and customers interested to see what’s inside. 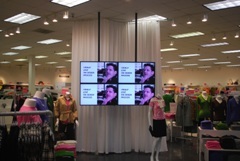 Our sales staff would be happy to help you discover how curtain tracks can transform your retail space. Give us a call at 888-434-7444.